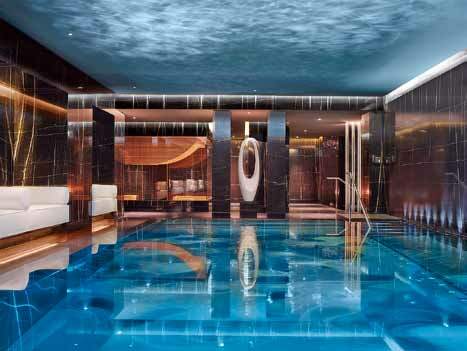 ESPA Life at Corinthia is the Best UK Hotel Spa according to Condé Nast Traveller Readers’. Designed by GA International, the spa officially opened in 2011 and welcomes over 15,000 guests each year. The design of the spa is all curves, with a luxurious sense of space, energy flow, soothing colours and tactile finishes. The 9m stainless steel swimming pool is by Barr+Wray, heated to 36 degrees is completed with airbeds and a massage waterfall. This zone also features a cluster of marble loungers, a contemporary black marble fireplace feature and an ice fountain. The glass amphitheatre sauna was specially designed by German wellness expert KLAFS and was the first of its kind in the world.